Posted in: St. Louis Cardinals. Tagged: Cardinal, Carpenter, Jaime García, Jake Westbrook, John Gast, Mozeliak, Shelby Miller. Adversity is nothing new to the Cardinals. It seems every year the Cardinals lose a key player from last year’s success. This year the industry was drooling over the Cardinal’s pitching success and depth. In the beginning fans were clamoring for Mozeliak to trade for a long term shortstop because we have “too much pitching”. I’m sorry but that statement doesn’t exist in my vocabulary. The Cardinal’s were trying some band aid solutions while waiting for news on Westbrook and Carpenter. Now they no longer have that option. Carpenter experienced his first set back in rehab. Westbrook is going to go see this guy named “Dr. Andrews”. Remember him? Yeah Jaime Garcia just visited him a week ago… he’s shelved for the season. About those band aids? Now John Gast is shut down with a shoulder strain. Options are running out. Shelby Miller is going to have to be our number 3 starter behind Lynn and Wainwright, who absolutely can NOT get hut. The Cardinals were trying to avoid this… to protect his development… now I think they have no choice. Mo was waiting for a permanent role. Now he’s got one. It really is time. 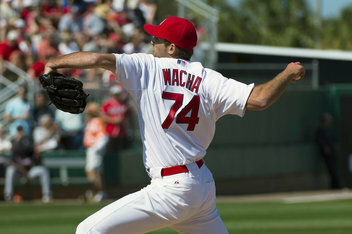 I understood why Gast and Lyons were called up over him, but with Gast out Wacha needs to be up here. He’s definitely ready with a 4-0 record and a 2.05 ERA. This will be the ultimate test to the Cardinal’s organizational strength. That bullpen is a mess with a confusing mix of starters and relievers with undefined roles in front of Mujica and Rosenthal. Mozeliak needs to figure this out and fast. The Reds and Pirates keep winning at alarming rates.